There are now 325,000 people waiting to buy a Tesla Model 3, the company's first mass market car. That's how many car buyers plunked down (refundable) deposits of about $1,000 in the first week that Tesla began taking them, the company said. 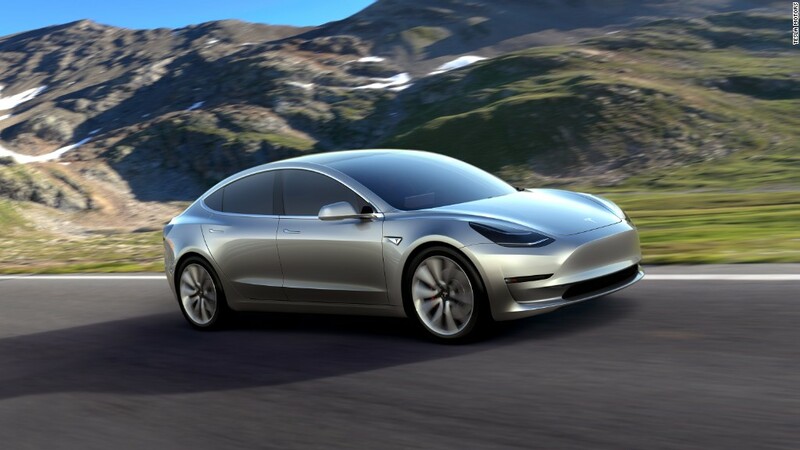 CEO Elon Musk unveiled the Model 3 on March 31. In a post titled "The week that electric vehicles went mainstream," Tesla (TSLA) said the deposits will equate to $14 billion in future sales. The cars have a $35,000 starting price, but Musk said last week that buyers are ordering options that bring the average price to about $42,000. Most of the orders came in just the first few days, with Musk tweeting that there were 276,000 placed through Saturday. He said even he was surprised by the volume of early orders. "This [is] the single biggest one-week launch of any product ever," said Tesla's statement. By comparison, Apple's (AAPL) largest launch logged at least $8.5 billion in sales, when the iPhone 6S sold 13 million units on its opening weekend. But Tesla's deposits are all fully refundable until the final sale of the car, as opposed to final sales for products like the iPhone. Model 3 buyers will have to wait a long time to get their cars. The first deliveries aren't due until the end of 2017, and Tesla's history suggests that production could ramp up slowly. The Model X, which was first delivered Sept. 29 last year, had only 206 deliveries in the last three months of last year, and 2,400 more in the first three months of this year. So many early Model 3 buyers will likely have to wait till 2018, if not 2019 to take delivery of their new cars. But Tesla said it is ramping up production so that buyers won't have to wait too long. "We would write more, but we need to get back to increasing our Model 3 production plans!" Tesla wrote at the end of its blog post.